It gets more and more likely that the Singapore GP will be held at night, as planned. In previous posts, I have doubted the feasibility of night races because of the safety aspect. It also seems something of an insult to Asian countries that they are expected to race at night purely for the convenience of European television viewers. 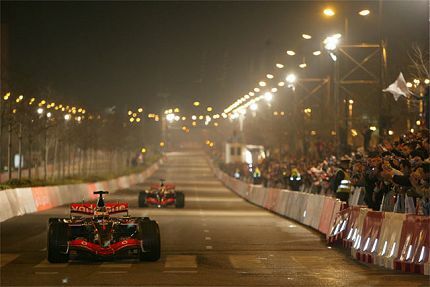 But I must admit that night racing, especially in a city, has great potential for being a dramatic spectacle. The contrast between the dark sky and surrounding buildings against the bright streets and gleaming cars flashing past promises an experience that we might well ask for more of. The photograph up there, taken at McLaren's launch of the MP4-22 earlier this year in Valencia, gives us a taste of what it might be like. Obviously, the barriers will be much further back and more substantial in Singapore but the gloom surrounding the tunnel of brightness, the pinpoints of light reflected in the polished bodywork of the cars, the scream of the engines ripping apart the quiet of the night, all these will be there. It may be a fierce test of the drivers' skill and adaptability, but for the assembled crowd it should be a memorable experience. So I am not entirely against the idea of night races in F1 and I would not be surprised if we were to grow to like them and demand more. But the safety aspect must be attended to carefully by the FIA; if there is a serious accident in Singapore, you can bet that much of the blame will fall upon its being a night race. The difficulties for the drivers are fairly obvious, vision being the main problem. Will they be able to see well enough to drive at their usual speeds? And the possibility of being dazzled by floodlighting is always there. Bad enough in the dry, you might think, but what if it rains? The reflections off the road surface could easily turn the circuit into a kaleidoscope of confusing light and shadow; add the spray creating a mist that hangs in the still air between the buildings and that surely is a recipe for disaster. Maybe I am being pessimistic. It may be that this worst case scenario I have painted never happens. But the FIA better be very sure that they have thought of every eventuality before the give the green light to the idea. It is always better to be safe than sorry. I think when something new like this comes along, it's very easy to get excited and carried away with it all - as you say it is going to be an amazing spectacle and hopefully won't become a tired gimmick if it's used too often. But, it's important that everything is though through carefully and the people in charge aren't the ones who get carried away - hope for the best but prepare for the worst as the saying goes. They must be pretty confident that they have the safety side of things under control or they surely wouldn't have made the idea public until all the issues were cleared up. I must admit I'm looking forward to it and hope that it lives up to our expectations! Agreed, Craig - it could be a fantastic sight and, in spite of all my pessimistic quibbles, I hope it works. We shouldn't forget that the FIA still haven't given the all-clear yet, so there are safety checks yet to be done. To give them their due, they're usually pretty hot on the safety side so, hopefully, if they say yes, it should be okay. I vote DOWN night races, Craig called it right, it is a Champ Car gimmick and Clive got it right in his article......"insulting Asian countries .... for the convenience of European (and USA) television viewers." And consider Bernie has dropped good races like the US and French GPs in leiu of this!!!! Enough said. True enough, Number 38, but it looks as though it's going to happen. It'll be interesting to watch, that's all. whether the Sing race will be day or night it still remains to be seen. One thing is for sure, I will be there because what I hear from friends down there in Singapore, it is going to be one hell of an event. From a TV point of view night race will probably be exciting change of the usual routine, but I think for the people watching live, day race would be better. When talking about Singapore - As I found out few days ago, they actually had races there called Singapore GP (and Malaysian GP for few years) in the 60s and early 70s, till some fatal accidents put stop to it. (i made a post on that few days back) So I believe the organizers there will take all the steps to make the race safe, and knowing Singapore, I kind of believe they will not run the race in the night if they are sure it is not feasible. Racing at night is great. Some of my best racing experiences have been at night - all my visits to Le Mans, the Swedish Rally, Rally GB, competing in rallies here in the US, ALMS at Laguna Seca... all brilliant stuff, with the non-visual senses heightened by the darkness. But therein lies the issue: the drama and spectacle will only really be enjoyed by those on site. For TV viewers it may end up being a tad frustrating. Yes, I can see what you mean, Neil. But note that in all your examples the cars carry their own lights - the really big difference with F1 racing at night will be the necessity of floodlighting the track. And that might destroy the effects as described by you. We can only wait and see.